It’s cold. And it is likely to get colder. 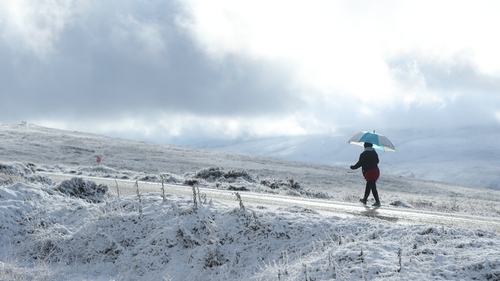 As temperatures plummet across the country, the risk of damage to property increases. But according to those in the insurance industry, there are many things you can do to minimise the chances of cold weather causing unnecessary cost and stress in your life. If you are a car or van owner, for example, a bit of preparation could help you avoid having an accident or incurring damage to your vehicle. Brokers Ireland says one of the most important things drivers can do is to check the tread depth on their tyres, which should be about 3mm. "Worn tyres are particularly hazardous in ice and snow," said Cathie Shannon, Director of General Insurance Services at Brokers Ireland. The pressure of tyres should also be checked, as cold weather can lead to a reduction in pressure. "It’s also important to know that front-wheel drive vehicles have greater grip, they handle ice and snow better than rear-wheel drives. Rear-wheel drive cars are more prone to skidding," she said. "Carrying weight in your boot can help somewhat by putting additional weight on the back tyres." Another tip to prevent unnecessary damage, according to experts, is to check there is sufficient antifreeze or coolant, while clean lights will make you more easily seen in the poor visibility that accompanies sleet and snow falls. While it is commonly thought that boiling water is the best way to clear a frozen windscreen, the reality is that could result in you needing to replace the glass, according to the brokers’ organisation. This is because boiling water can crack the glass, so lukewarm water is just as efficient, but less likely to cause damage. Once on the road, remember that in freezing conditions braking is more hazardous. According to the AA, it takes up to ten times longer to stop on an icy road, so in affected areas, slow down, keep further back from the vehicle in front and keep all manoeuvres gentle. Also make sure to plan your journey, check road conditions before you travel, stick to main roads where possible as they are more likely to be gritted and carry a charged phone, as well as a full tank of fuel in case you run into delays. But it is not just motoring that carries a risk of damage to property in cold weather, according to the insurance industry. Low temperatures, ice and snow also threaten homes and other buildings, with freezing pipes a big issue. So according to Insuremyhouse.ie, now is a good time to ensure water pipes and water tanks in the attic are insulated with good quality lagging. It also recommends that taps are turned on regularly to make ensure there is a period flow of water through them. Leaving the heat set to come on regularly on a timer is also a good idea, if you are going out or away for an extended period, it says. "There’s no doubt that there will be people throughout the country who will have to make a claim as a result of this extreme weather snap," said Jonathan Hehir, Managing Director of Insuremyhouse.ie. "But how big the claim needs to be - or more importantly, how much damage is caused to their property, can sometimes be lessened by taking a few simple safety precautions." Other suggestions include locating the stopcock so that if a pipe does burst you can turn the supply to the house off quickly. The insurer also said its important to remember outside taps and hoses, which should be drained, isolated and insulated where possible to stop them freezing and splitting.